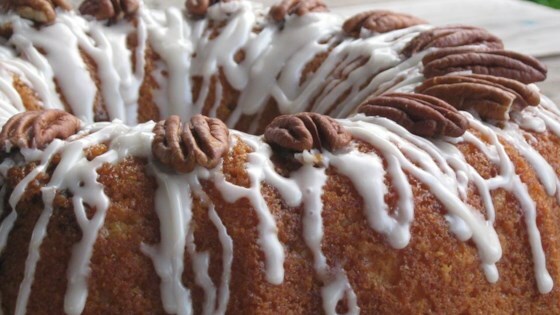 "This cake tastes just like the name suggests - like a honey bun. It has been served to hundreds of people and everyone has said how much they liked it. It is a sweet cake and not for those that are watching their weight. Tastes wonderful if served with a small scoop of vanilla ice cream." In a large mixing bowl, combine cake mix, oil, eggs and sour cream. Stir by hand approximately 50 strokes, or until most large lumps are gone. Pour half of the batter into an ungreased 9x13 inch glass baking dish. Combine the brown sugar and cinnamon, and sprinkle over the batter in the cake pan. Spoon the other half of the batter into the cake pan, covering the brown sugar and cinnamon. Twirl the cake with a butter knife or icing knife until it looks like a honey bun (or whatever design you want to make). Bake in preheated oven for 40 minutes, or until a toothpick inserted into the center of the cake comes out clean. Frost cake while it is still fairly hot. Serve warm. To Make the frosting: In a small bowl, whisk together the confectioner's sugar, milk and vanilla until smooth. everyone at my family BBQ love it! the only thing i did different is i made them into cupcakes to make it easy to pick up and go.